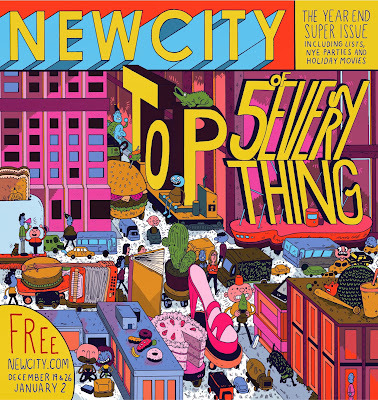 Yesterday Newcity released its annual Top 5 of Everything issue. And like last year I have a few running lists in there. There are also a number of other good lists in this issue (it is an issue of lists after all) so either check it out at a newstand or local shop near you (maybe this distribution map will help) over the next few weeks or view the complete list online via the link above. Last year I made a semi-resolution to run 52 races this year (after running 45 in 2012) but I fell pretty far short of that goal after my IT band injury... so maybe I'll move that goal forward and try again in 2014. I love the Carrera de los Muertos race. The Chi-Town Big Game 5K is one of your top 5 huh? I got an email about it and thought about running it. I'd definitely recommend checking it out - running in February obviously isn't ideal but it's a cool experience - especially because you get to hang out in the United Club before and after the race.